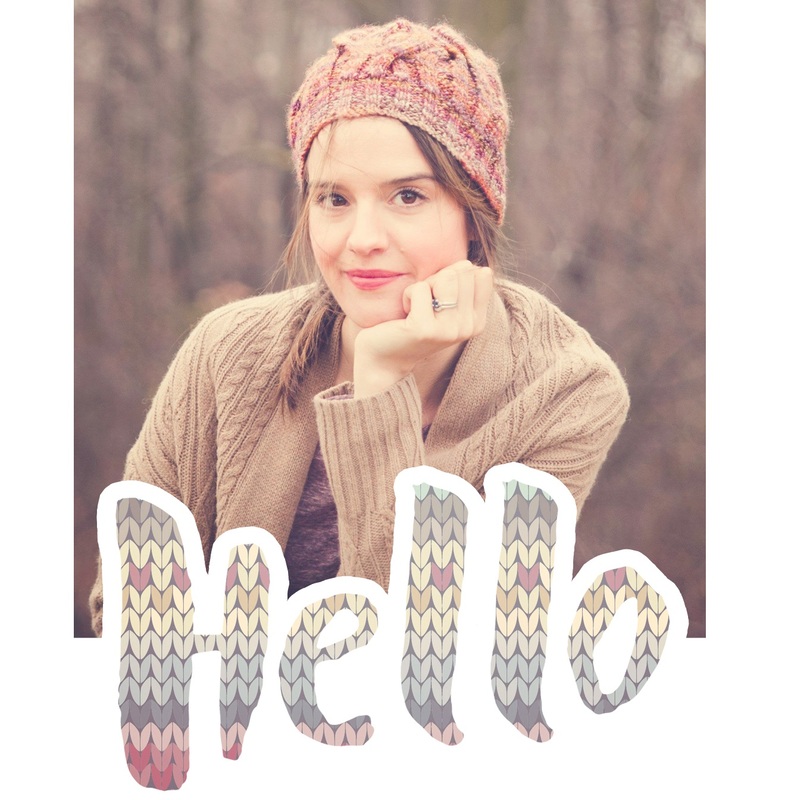 I love cold-weather knitting as much as any knitter. So much so that I usually avoid knitting summer tops altogether; as a tight knitter I often dislike knitting with inelastic plant-based fibres. But this past fall and winter I knit mostly for others and before I got the chance to knit the fisherman’s gansey I’d wanted for myself, April was just around the corner. Rather than wait until the fall, I thought I’d marry the trending curved hem t-shirt silhouette to a more traditional gansey sweater and use some of the drapey, nubby silk yarn I’d stashed for far too long. A quick note on the photos : as usual I relied on my camera's self-timer, but this time I brought along my Gorilla-pod, a creature-like tripod with flexible legs and I just want to say that it is awesome. It gripped branches so easily ; no more propping up my camera on rocks (like I did for the Handspun Spinster Slouch photos)! If you take your own FO photos I highly recommend it! Je préfère de loin tricoter pour les mois d’hiver, des vêtements chauds faits de laine et d’alpaga. Le coton, le lin et la soie peuvent être dur sur les doigts, surtouts les miens qui tricotent très serré. Mais ayant bricolé plutôt pour les autres ces derniers mois, je n’ai pas eu le temps de me tricoter un pull gansey avant que le printemps se pointe du nez. Mais pourquoi attendre jusqu’à l’automne lorsqu’on peut marier la silhouette du t-shirt tendance avec ourlet arrondie aux patrons de gansey traditionnels? Le design doit son nom à une région de l’Ontario connue pour la pêche et sa proximité à non moins de trois lacs. Et à une chanson du groupe belge Hooverphonic que j’écoutais à répétition dans mon adolescence! Size (circumference of the tee in inches): 34 (35.5, 37, 39, 41, 42.5). Since the design is top down, you can divide the stitches among 2 sets of circular needles to try on the top as you go, sizing the arm holes and shirt length according to your size and shape. Note: Because of the necessary additional raglan increases required for the larger sizes, I had to add a pattern repeat to sizes 37, 39, 41, and 42.5. I chose an andalusian stitch motif, (not pictured in the sample because it is not needed for size 34). Yarn : For size 34: 6 skeins of Silk Sensation by Fiddlesticks Knitting. You will need to estimate yardage for the other sizes. 4 stitch markers, one of them unique to mark the beginning of rounds. Gauge after blocking : 18 sts and 32 rows using US 6 (4mm) needles in stockinette stitch over 4 inches square. kfb : knit in front, then in back of same stitch. pfb : purl in front, then in back of same stitch. Until round 36, raglan increases are done every 3rd round by increasing 1 stitch on each side of markers. 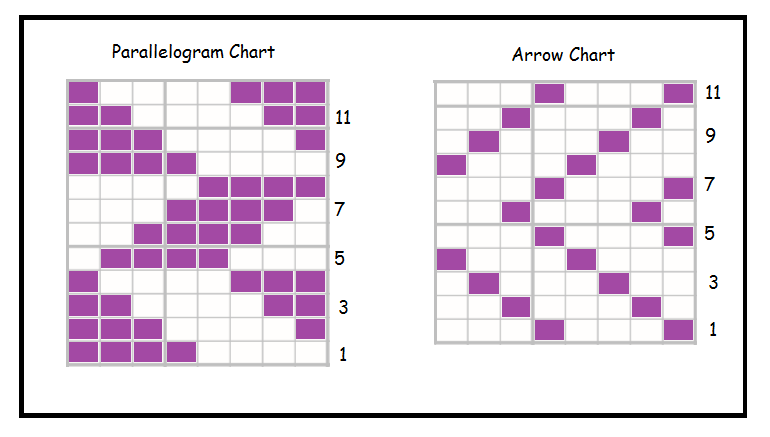 I’ve written out the instructions for the first two gansey stitch patterns, and made charts for the last two. Sizes 37 and up will need to add an additional gansey panel, instructions are in blue. There is no side-shaping for the body. I had planned on the tee having a loose, breezy fit with lots of positive ease but that just didn’t work out. In fact, it’s quite tight on my hips! 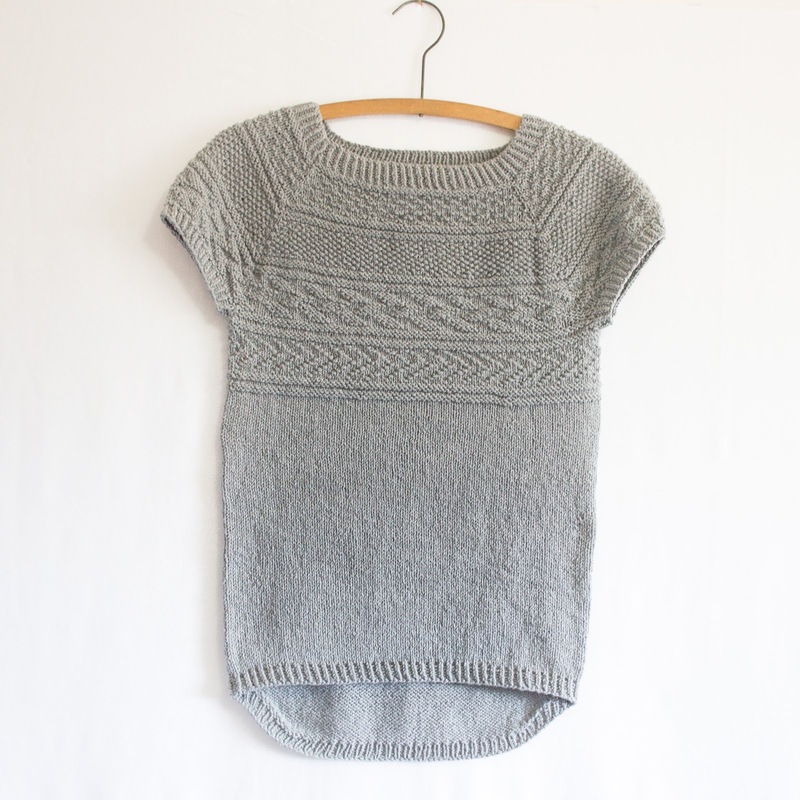 It’s a good idea to continue to try on the tee as you knit so that you can add stitches to widen for hips if need be or add shaping in the just right spots for a more hourglass shape. Change to US6 needles. Working in twisted rib for one more round, place markers as follows : Work 43 (45, 47, 49, 51, 53) sts, PM, work 25, (27, 29, 31, 33, 35) sts, PM, work 43, (45, 47, 49, 51, 53) sts, PM, work remaining 25, (27, 29, 31, 33, 35) st. Round 3 (increase round) : kfb, k to 1 st before marker, kfb, slip marker, kfb, k to 1 stitch before next marker, kfb, slip marker, kfb, k to 1 stitch before next marker, kfb, slip marker, kfb, k to 1 stitch before next marker, kfb. Extra round 2 : purl. Extra round 3 : (increase round) pfb, p to 1 st before marker, pfb, slip marker, pfb, p to 1 stitch before next marker, pfb, slip marker, pfb, p to 1 stitch before next marker, pfb, slip marker, pfb, p to 1 stitch before next marker, pfb. Extra round 4 : knit. Round 4 : (k2, p2) to 3 sts before marker, k2, p1, slip marker, (k2, p2) to 1 st before marker, k1, slip marker, (k2, p2) to 3 sts before marker, k2, p1, slip marker, (k2, p2) to 1 st before marker, k1. Round 6 : (increase round) kfb, k3, (p2, k2) to 3 sts before marker, p2, kfb, slip marker, kfb, k3, (p2, k2) to 1 sts before marker, kfb, slip marker, kfb, k3, (p2, k2) to 3 sts before marker, p2, kfb, slip marker, kfb, k3, (p2, k2) to 1 sts before marker, kfb. Round 8 : k3, (p2, k2) to 2 sts before marker, p2, slip marker, k3 (p2, k2) to marker, slip marker, k3, (p2, k2) to 2 sts before marker, p2, slip marker, k3 (p2, k2) to end. Round 9 : (increase round) kfb, k to 1 sts from marker, kfb, slip marker, kfb, k to 1 sts from marker, kfb, slip marker, kfb, k to 1 sts from marker, kfb, slip marker, kfb, k to 1 sts before marker, kfb. Round 10 : (k2, p2) to 3 sts from marker, k2, p1, slip marker, (k2, p2) to 1 sts from marker, k1, slip marker, (k2, p2) to 3 sts from marker, k2, p1, slip marker, (k2, p2) to one sts before marker, k1. Round 12 : (increase round) kfb, k3, (p2, k2) to 3 sts before marker, p2, kfb, slip marker, kfb, k3, (p2, k2) to 1 sts before marker, kfb, slip marker, kfb, k3, (p2, k2) to 3 sts before marker, p2, kfb, slip marker, kfb, k3, (p2, k2) to 1 sts before marker, kfb. Round 14 : k3, (p2, k2) to 2 stitches before marker, p2, slip marker, k3, (p2, k2) to marker, slip marker, k3, (p2, k2) to 2 stitches before marker, p2, slip marker, k3, (p2, k2) to end. Round 15 : (increase round) kfb, k to 1 st before marker, kfb, slip marker, kfb, k to 1 stitch before next marker, kfb, slip marker, kfb, k to 1 stitch before next marker, kfb, slip marker, kfb, k to 1 stitch before next marker, kfb. Rounds 16 AND 17 : purl. Round 18 : (increase round) kfb, k to 1 st before marker, kfb, slip marker, kfb, k to 1 stitch before next marker, kfb, slip marker, kfb, k to 1 stitch before next marker, kfb, slip marker, kfb, k to 1 stitch before next marker, kfb. Round 21 : (increase round) pfb, p to 1 st before marker, pfb, slip marker, pfb, p to 1 stitch before next marker, pfb, slip marker, pfb, p to 1 stitch before next marker, pfb, slip marker, pfb, p to 1 stitch before next marker, pfb. Round 23 (seed stitch begins): (k1, p1) to 1 sts before next marker, k1, slip marker, (k1, p1) to 1 sts before next marker, k1, slip marker, (k1, p1) to 1 sts before next marker, k1, slip marker, (k1, p1) to 1 sts before next marker, k1. Round 24 : (increase round) kfb, work in seed stitch (purling the previous row’s knit stitches and knitting the purl stitches) to 1 st before next marker, kfb, slip marker, kfb, work in seed stitch to 1 st before next marker, kfb, slip marker, kfb, work in seed stitch to 1 st before next marker, kfb, slip marker, kfb, work in seed st to 1 st before end, kfb. Round 25 : Work in seed stitch. Round 26 : Work in seed stitch. Round 27 : (increase round) kfb, work in seed stitch (purling the previous row’s knit stitches and knitting the purl stitches) to 1 st before next marker, kfb, slip marker, kfb, work in seed stitch to 1 st before next marker, kfb, slip marker, kfb, work in seed stitch to 1 st before next marker, kfb, slip marker, kfb, work in seed st to 1 st before end, kfb. Round 28 : Work in seed stitch. Round 30 : (increase round) kfb, work in seed stitch (purling the previous row’s knit stitches and knitting the purl stitches) to 1 st before next marker, kfb, slip marker, kfb, work in seed stitch to 1 st before next marker, kfb, slip marker, kfb, work in seed stitch to 1 st before next marker, kfb, slip marker, kfb, work in seed st to 1 st before end, kfb. Round 31 : Work in seed stitch. Round 33 : (increase round) kfb, work in seed stitch (purling the previous row’s knit stitches and knitting the purl stitches) to 1 st before next marker, kfb, slip marker, kfb, work in seed stitch to 1 st before next marker, kfb, slip marker, kfb, work in seed stitch to 1 st before next marker, kfb, slip marker, kfb, work in seed st to 1 st before end, kfb. Round 34 : Work in seed stitch. **Stitch count between markers at this point should be : 65, (67, 71, 73, 75, 77) each front and back / 47, (49, 53, 55, 57, 59) each sleeve. 224, (232, 248, 256, 264, 272) sts on the needles in total. There have been 88 (88, 96, 96, 96, 96) st increased since cast-on. Rounds 36: (increase round) pfb, p to 1 st before marker, pfb, slip marker, pfb, p to 1 stitch before next marker, pfb, slip marker, pfb, p to 1 stitch before next marker, pfb, slip marker, pfb, p to 1 stitch before next marker, pfb. Round 39: (increase round) kfb, k to 1 st before marker, kfb, slip marker, kfb, k to 1 stitch before next marker, kfb, slip marker, kfb, k to 1 stitch before next marker, kfb, slip marker, kfb, k to 1 stitch before next marker, kfb. Stitch count between markers at this point : 69, (71, 75, 77, 79, 81) each front and back / 51, (53, 57, 59, 61, 63) each sleeve. = 240, (248, 264, 272, 280, 288) sts total. Round 42: (increase round) kfb, k to 1 st before marker, kfb, slip marker, kfb, k to 1 stitch before next marker, kfb, slip marker, kfb, k to 1 stitch before next marker, kfb, slip marker, kfb, k to 1 stitch before next marker, kfb. Stitch count between markers: 71, (73, 77, 79, 81, 83) each front and back / 53, (55, 59, 61, 63, 65) each sleeve. = 248, (256, 272, 280, 288, 296) sts total. Round 55 : (increase round) kfb, k to 1 st before marker, kfb, slip marker, kfb, k to 1 stitch before next marker, kfb, slip marker, kfb, k to 1 stitch before next marker, kfb, slip marker, kfb, k to 1 stitch before next marker, kfb. Stitch count between markers : 73, (75, 79, 81, 83, 85) each front and back / 55, (57, 61, 63, 65, 67) each sleeve. = 256, (264, 280, 288, 296, 304) sts total. Time to try on the tee! Get hold of another long set of circular needles (size US6 or smaller) and place half of the stitches on it so that your sweater now rests on 2 separate circular cords, allowing you to stretch your sweater enough to pull in on over your head. Does your knitting reach your armpits yet? If so, jump to Round 57 and ignore the following (if you’re making size 34 or 35.5, it should reach your underarms). 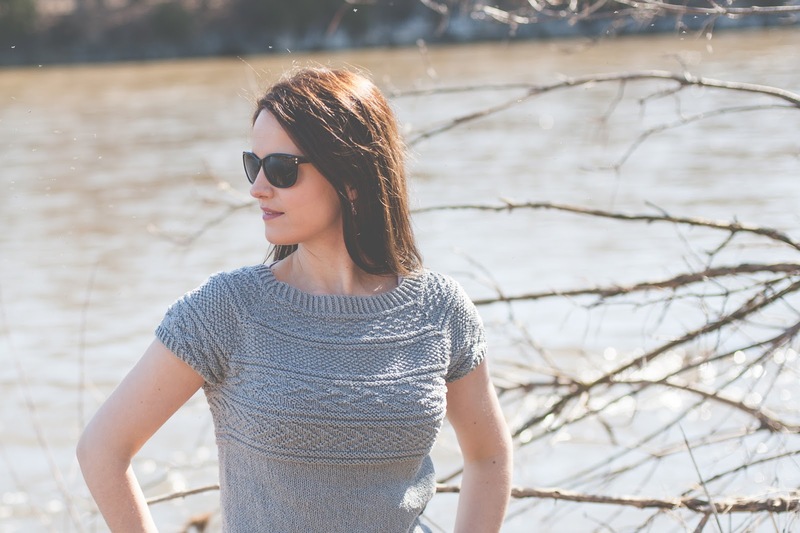 If you’re knitting the other sizes, chances are that your sweater doesn't reach your underarms just yet, so you’ll need to lengthen your knitting before moving to round 57. In order to preserve the gansey-style, I've added an extra 16-round motif section in Andalusian stitch that will add 2 inches of length to your knitting. Extra round 2: sizes 37 and 39: knit (do not increase). Sizes 41 and 42.5: (increase round) kfb, k to 1 st before marker, kfb, slip marker, kfb, k to 1 stitch before next marker, kfb, slip marker, kfb, k to 1 stitch before next marker, kfb, slip marker, kfb, k to 1 stitch before next marker, kfb. Stitch count between markers : --, (--, 79, 81, 85, 87) each front and back / -- (--, 61, 63, 67, 69) each sleeve. = --, (--, 280, 288, 304, 312) sts total. Extra round 5: (k1, p1) to the end of round. Extra round 9: (k1, p1) to the end of round. Extra round 13: (k1, p1) to the end of round. Round 57 : purl to first marker before the sleeve stitches, slide the sleeve stitches to scrap yarn or stitch holder, using backward loop method, cast on 3 (5, 5, 7, 7, 9) stitches onto the right needle, purl to the next marker before the next sleeve sts, slide the second sleeves’ sts onto scrap yarn or stitch holder, cast on 3 (5, 5, 7, 7, 9) stitches onto the right needle, purl to end. Make sure to keep the stitch marker that indicates the start of round for the body! We’ll come back to work the sleeves later. Body stitches (including new cast-on stitches) is: 152 (160, 168, 176, 184, 192) stitches. Work in stockinette stitch until desired length has been reached. I knit 14 inches down from the armhole before beginning short row shaping for the curved hem. Take 2 stitch markers. Lay the top flat and mark the two side stitches. 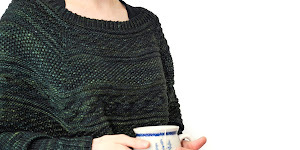 I lightly steamed the top so that it lay perfectly flat before adding the stitch markers – it’s important to select the right stitches so that the curved hem is centered! Knit across the back to within 3 sts of side marker, wrap the next stitch (with yarn in back, slip next stitch from left hand to right hand needle, bring yarn to front of work, slip back to left hand needle). Turn work around and purl back to other end to within 3 sts of the other side marker. Wrap next st, turn, knit back to other end to within 4 sts of the other marker. Wrap and turn, purl to within 4 sts of other marker. Wrap and turn, knit to within 5 sts of other marker, wrap and turn, purl to within 5 sts of other marker, wrap and turn. Repeat until you have wrapped and turned to 13 (15, 17, 19, 21, 23) sts from markers. Then knit one full round, picking up wrapped stitches as you go. Change to US5 circular needles and work in twisted rib for approximately one inch. Cast off loosely. Evenly distribute the sleeve stitches onto the US5 DPNs and up the stitches along the gap under the sleeve. Work in the round in twisted rib for approximately 1 inch. Cast off loosely. 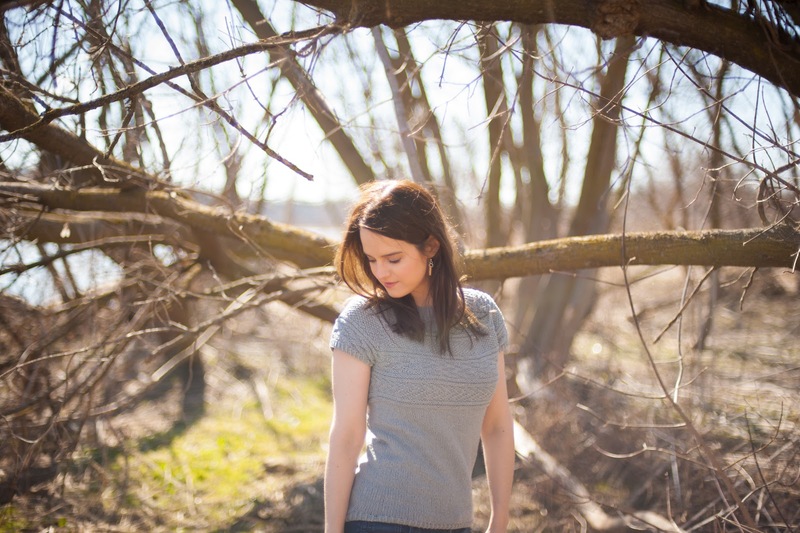 I’m not a professional designer and am sharing my instructions out of love of ganseys, the coming summer, and the knitting community. If you notice errors or have suggestions, I’d love the chance to improve the pattern. And as always, if you you knit the sweater and would like to give back, please consider making a small donation to your local food bank or women’s shelter. Thank you!